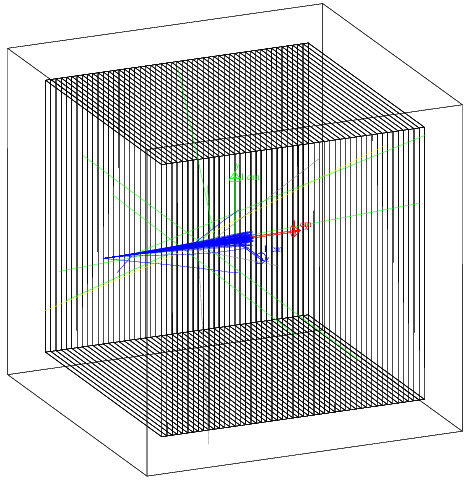 This tutorial is based on the Monoenergetic proton pencil beam example. 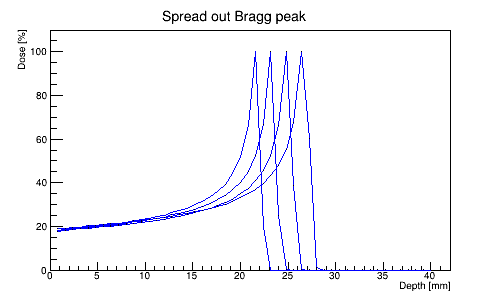 The code run with several beam energies to produce spread out Bragg peak. The water cube is divided into slices using class G4PVReplica. At each slice the deposited dose and energy for every energy beam is computed. The energy and the dose are scored using classes G4UserSteppingAction and G4UserRunAction. The proton beams are simulated using G4ParticleGun class. There is an option to chose among several EM and the QGSP_BIC_EMY physics lists. This image shows only one proton beam energy. The water box is divided into slices using class G4PVReplica. Photons are in green, protons are in blue, neutrons are in yellow. [username@plus1 PhotonSBFolder]$ cp -r /unix/pbt/tutorials/basic/ProtonSB . The code produces two text files DoseFile.txt and PlotDose.txt. The file DoseFile.txt contains energy and dose deposition for every layer and for every beam energy. The file PlotDose.txt contains only depth vs dose for each layer for every beam energy. These text files can be analyzed with MATLAB or ROOT. This is the content of DoseFile.txt with proton beam energies 50, 52, 54 and 56 MeV. This is the content of the PlotDose.txt. where "50" is the initial value, "56" is the final value and "2" is the step size in MeV. If you want to use visualisation (with DAWN), in macro proton.mac uncomment line #/control/execute visualisation.mac. Then, run the code. You will have four images from the four proton beams. Protons are in blue, neutrons are in yellow, photons are in green. This page was last modified on 3 September 2014, at 19:06.